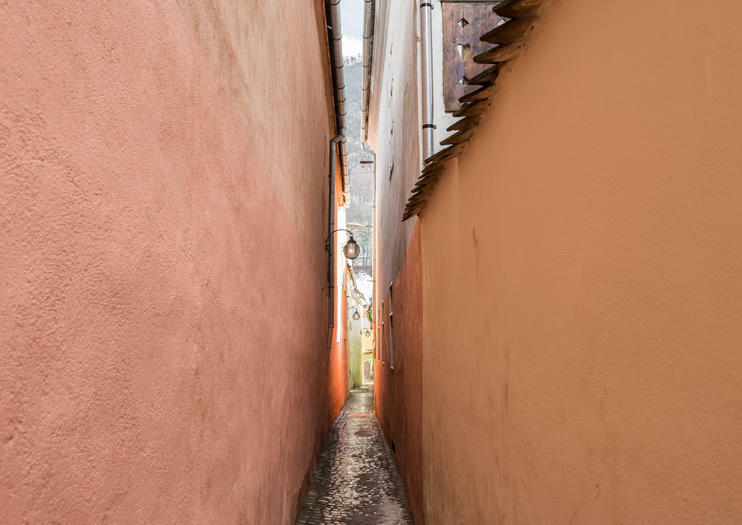 Reputedly the narrowest street in Europe and certainly the narrowest in Romania, Rope Street (Strada Sforii) connects Cerbului with Poarta Schei in Braşov’s Old Town. It is 262.5 feet (80 meters) long and just 3.5 to 4.5 feet (1.10–1.35 meters) wide, making it almost impossible for two people to pass each other. It has its origins somewhere around the beginnings of the 17th century and may have been built for access by firefighters into the Old Town. Renovated in 2003, Strada Sforii is signposted from both ends and bears a plaque declaring its dimensions; it’s a favorite photo spot for travelers to the city. Strada Sforii. Open 24/7 with no admission charges. Forget the hassle of navigating public transport and discover iconic Transylvania on a private day trip to Bran Castle and Brașov from Bucharest. Gain insight into the region’s history and vampiric legends from your guide as you traverse the mountainous landscape with ease, and avoid hidden costs with entrance fees to attractions included in the price. Steep in Transylvania’s compelling history during this 2-day private tour from Bucharest. A professional local guide will meet you in Bucharest. From there, you will head into the Transylvania countryside and explore the medieval cities of Brasov, Bran, and Rasnov over the course of two days. As you travel, your guide will gladly fill you in on Romania’s complicated and fascinating history. This is a great way to explore Transylvania’s castles, villages, and fortresses by car and foot. Immerse yourself in the unique culture, history and flavors of Romania on a private 8-day tour that takes you to the most fascinating villages and monuments of Transylvania. Departing from Bucharest, travel in a private vehicle through the country’s historic heart, staying in medieval villages and touring Gothic castles, splendid palaces, imposing fortress, monasteries and other historic gems. Overnight accommodation and all transport are arranged by your private guide, so you can relax and enjoy your Romanian holiday! Delve deep into Transylvania on this 2-day Transylvania Halloween experience and costume party, from Bucharest. On this unique tour, not only will you immerse in Transylvania’s haunting history—you’ll live it, when you attend a costume party at Dracula’s Castle! Meet your fun local guide in Bucharest, then head into the Transylvania countryside for two days of exploring its Gothic villages, stunning mountains and of course, Bran Castle. New in town, eager to explore downtown Brasov but you have limited time?Then this tour is perfect for you: you will see the most important monuments of Brasov, discover curiosities, city legends in only one hour without spending a fortune!